What do Maryland equestrians want in their state Horse Park? And most of all…. I’d like to see all of this in ANNE ARUNDEL COUNTY! Thanks! As vice president of the Southern MD Quarter Horse Association, we would like to have a nice show grounds with stalls, covered ring and electric/water for hook-ups. Something like the state fair grounds in Harrington, DE. We will no longer be holding our annual quarter horse show at PG Equestrian Center. The grounds are falling apart and no support there. We would like to see a Horse Park in the Bowie area, this is central to Maryland. Thanks for the opportunity to give some input. Permanent cross-country course, with obstacles for all levels from beginner novice to advanced, that would be open year-round for schooling. Trail rides/horse rentals. Some inexperienced people without their own horses get a lot of joy out of these – my family went often when we were kids and it was some of the happiest times. I would like to see a facility with rock free, even cushioned footing in the rings, safe stabling with solid walls between horses, and adequate warm-up areas. Also inside wash racks with good lighting and a well draining floor. Clean, well maintained restrooms with showers would be a great bonus. Have sent survey by snail mail last week, but here’s another 2 cents worth of opinion. After I sent the survey, I rode at a Fair Hill competitive trail ride and spoke to a few people about making that area the Maryland Horse Park. I was really surprised to find many local people against any changes to Fair Hill. Why? Economics – will make land value increase in an area that is already very expensive. With increased land value comes higher taxes. Management – even though some people are not 100% happy with the current management of Fair Hill, it appears that the fear of the unknown is of higher risk to them. What will take precedence for event scheduling? Make sure you have someone who understands your area though. I have heard good things about oregon long term property management. Traffic – feel that the current infrastructure can barely handle the special weekend events, so having traffic jams on most weekends is a turn-off for locals. Cost – will having new management increase the rental costs for everyone? Reserved stall, reserved camping fees may increase. It’s perceived that horse people are all rich so should pay for the many amenities that a state horse park will provide. I’m sure there are other reasons that locals are against a state horse park in their backyard, but as an outsider who rides the Fair Hill endurance and competitive trail competitions, I think it’s a great idea. I’ve been to KY horse park for an endurance ride and was really impressed with how well everything worked together without interference. Imagine – four horse shows (one in-door, 2 hunter/jumper shows and a dressage competition), a 50-mile endurance race, soccer games and a dog show all at the same time! It was wonderful! And as a traveler, I appreciated having the option to browse the show and food vendors whenever I had time. I love Fair Hill, but selfishly, I would like to see the MD horse park in a more central location in the state, preferably not too near I-95 or 695 or 495 – which have too much traffic now. Near I-70 would be a good choice, somewhere between Patapsco State Park and Hagerstown, which gives travelers several approach options in case of high volume traffic and boost economics in the western part of the state. Affordable stabling, free hacking areas free of automated vehicles and / or bikes. * GOOD facilities FOR THE HORSES. Especially SAFE, SUFFICIENT SHOOLING areas and GOOD ALL-WEATHER FOOTING! * Availability of parking for one-day haul-ins (to promote LOCAL people coming to the events) WITHOUT ridiculous fees. * Nearby access to reasonably priced and prepared food, reasonable hotels (think Lexington VA). Camping facilities, preferably with some hook ups, but most importantly on high ground with nearby fields for temporary corrals and access to stables. Good road access to campground–at least solid gravel. First, I would like to see a park located central to all of Maryland, not one in Laurel as we would not use it at that point. Second, I would like to see a show facility, as well as a park that could meet all of the needs to each of the main disciplines of riding- trails cross country 3 phase, etc. as well as shows. Again, location is the most important part of this process. It should be central to all of the state, not just to Washington or the southern counties, as they have the center in Prince George County. Thanks for asking! We would love to see dressage arenas along with a cross country field similar to Fair Hill MD. 1. I would like to see open space to ride around and warm up your horse. 2. Permanent, secure, safe stabling with mats and wash stall with hot/cold water. 3. Several dressage arenas, one indoor with a sound system for Musical Freestyles and announcements, etc. Would also be nice to have a covered outdoor arena with stadium seating. 4. Large gravel, not grass/mud, trailer parking area (both overnight and day only lots). 5. Outdoor water faucets near the day parking lots. 6. The area be fenced or located in area that if a horse gets loose, he’s not able to get to a high traffic road. Good cross-country and steeplechase tracks for three-day events and horse trials, groomed trails, ample covered and outdoor arenas with good drainage and footing for dressage and jumping, level warm-up areas with good footing, stabling with 11’x11′ or bigger stalls and wash racks, separate area for trailer and RV hookups, parking out of the way of horse traffic, seating/viewing areas for spectators, centralized office, and gazebo/covered deck/pavilion for casual eating/meeting/chilling. I would love to see a training track to gallop horses who are racing from off the track and event horses, or anyone else who would like to condition their horses. However, if non race track horses are conditioning the rules of a race track should be followed. Also a cross country schooling area. Trails, as well as outdoor arenas with good footing and adequate drainage. Perhaps some sort of education facility, which would offer lectures or clinics. I would like to see a museum dedicated to the role of the horse in the history and evolution of mankind. A miniature KY Horse Park with an eventing CCI**** once or twice a year (so a four star X-country course and steeplechase track, dressage rings, etc.) weekly horse shows, camping and everything the KY horse park has to offer. Thanks! I would love it if the horse park could be located in Crownsville. We recently moved to Annapolis and I miss the accessability of shows and lessons when I boarded in Montgomery County. A cross country course and an indoor ring would be wonderful. In Anne Arundel county indoors are far and few between which unfortunately limits riding in bad weather and during much of the winter. Separate arena’s for dressage and other disciplines. Lots of warm-up areas w/proper footing. Hot water wash stalls. Well ventilated stables, bright and airy. Indoor facility!! Very important for shows and clinics. Good solid stalls–large enough to stable the large warmbloods. Electrical outlets [each stall] available for fans in the barns. As an endurance rider, I don’t really fit into the Horse Park crowd, but . . . having just done a 2 day CTR at Fair Hill, which has the ground to put on CTR’s and endurance rides, a wish list would be lots of trails of varying terrain, ground to camp out with my horse ( nice flat grassy field with good drainage so trailers don’t get stuck if it rains). I really don’t like having to put the horse in a stall, which we had to do at Fair Hill, as it’s better for an endurance horse to be able to walk around an electric pen and get stretched out, plus it’s easier to care for the horse if they are next to the trailer where all my stuff is. A covered pavilion with some sort of kitchen is good for after-ride meals, briefings and awards. A water spigot is good near the trailer parking, altho endurance riders are used to bringing their own water. The vets would like some sort of covered arena (can be open sided) to trot out & check the horses if it’s raining (we go rain, shine, or snow). And to be really picky, if the trails can be accessed by SUV’s, it makes them easier to mark and to post spotters during the ride. I am a supporter of the horsepark. I visited the one in Kentucky, which was beautiful. I attended one of the Breyer Horseshows. Though I think of a Horsepark as more than a museum facility and arenas for competitions. It would be nice to have a horsepark with versatility,more accessible for use of us small time land and horse owners, not just to organizations. With parking space for trailers and accessible trails on the property. I think it should promote visitor environment, promoting the history of horses and tack history, and the different varieties of horsemanship; promoting both the non-competitive and competitive interest. I don’t belong to any specific organization currently. My children are now grown, but belonged to th 4-H organization. My daughter attended the National’s in Kentucky. Many years we went to the Carroll County agricultural center for a “Round-Up” – a camping event w/ competitions, seminars, and demonstrations. A Horsepark facility could provide a central location, for such events; and hopefully with visitor encouragement, the competitions would be more open to the public to observe and encouragement to become more involved in the equine sport. The Horsepark should have a camping facilities, with horse stables. An example would be the popular campground in Gettysburg, where visitors or travelers passing through can access other trails. The Horsepark in this time of developers buying up so much farmland and cluster housing. It’s a challenge for the equine interest to be promoted in this state. If people can’t access the interest, the children of today will stay in the house with computers and technology games; not being able to promote their interest in horses. The parents won’t promote any interest, only channel the energy into other sports of soccer, lacrosse, baseball, etc. I hope this gives you some of what you were looking for. I don’t have an organization that has specific needs. I am just a sole person with interest in horses and 2 children, 1- rode since 7 years old, now 23 yrs old living in an apartment and 1 -18yrs old, riding since 2yrs old living at home. Currently we board 2 horses with Lynn Shpak at Statesman Morgan facility. The 18 yr old and I live on 6 acres in Howard County and plan to have the Bashkir Curly on our property, so a horsepark would provide us access to that versatility and a central location for other equine activities that we might like to support. Naturally I would love to have the MHP next door to me so I could go to lots of functions as a spectator–but practically, I think Crownsville is the best site. Too bad it is so close to the PG Equestrian Center and Rosaryville. I would like to see the horse activities spread out a little bit more. I am for anything that promotes the horse within the boundaries of human use of these wonderful animals. I would like to see a center that would include seminars on everything from training to care, management of different diseases such as founder. It would be amazing if we could host the World Horse Expos that are currently held in Timonium and Harrisburg. Have more fun type activities such as scavenger hunts, trail rides, fun shows. We don’t have much in this area in the way of Arabian specific shows, Western Pleasure, etc. It would be wonderful to include different disciplines other than dressage and hunt seat. I think this would be a wonderful addition to our area. The riding trails in Fair Hill should be maintained and accessible with or without the horse park. I don’t believe we, especially those of us already paying MD taxes should have to pay to use the trails. In most state parks in other states I have ridden, there is no charge for parking and riding those specifically designated for equine use. An experimental station for the use/re-use/ etc of manure and compost for energy generation before its use as soil enhancement. Manure while rotting, makes heat. I think that since Marylanders have nearly the most horses per capita compared to other states in the nation, and because we have tremendous wealth- the park should be the jewel of horse parks and include the best for all disciplines. Personally, my interest would be in a good indoor arena and a well maintained turf course of some sort (irrigated). Please forward this to the North Pole. Cross Country course with low and high jumps, some sort of lesson or trail ride facility, lots of different horses with different backgrounds and different breeds, demonstrations, opportunities for people to touch, groom, pet, or ride the horses. A school type thing for less experienced horse people to learn more in-depth things about various subject – farrier things, vet things, all different disciplines etc. Dressage arena, stadium jumping arena, cross country area, Hall of Champions, exhibition area, trail rides or trail riding available…and if is on the Eastern Shore I would like a job there. I would like to see cross-country schooling facilities. I would like to see in the Maryland Horse Park a destination for horse people and others who love to watch and be close to horses, especially children. 2. places for at least 6 dressage arenas with excellent footing (that is maintained) for dressage competitions. 6. Large indoor arena (heated) with seating for 500-1000 for smaller clinics and excellent footing. a. convenient, no-cost parking that is not muddy when it rains. d. animal petting area and other activities for children and their parents who are not usually around horses: lots of activities for them to see and do relating to horses such as buggy ride tours around the facility, some sort of walking trails where they discover facts about horses and find fun things to do such as a corn maze or finding something small in a hay stack. c. Museum of the horse: the Md horse industry through the years and where it is going today, including all disciplines as well as the Thoroughbred. People can donate photos and memorabilia of the Preakness, the Md. Hunt Cup and eventing, dressage, western riding, etc. 2. Ongoing clinics for all disciplines to improve people’s skills at all levels including business practices. Finally, as long as we are making a wish list: Why not begin a nationally recognized educational training center similar to the one in Warendorf, Germany, where young people are trained by the best to become equine professionals and taught a standard method for beginning the training of young horses who can go on to any discipline. Hope this helps. Think Big! • Food court in main area with kiosks throughout the park. With the option to get one here,there shouldn’t be any excuses as to why an outdoor kiosk cannot be implemented. • Some camping/RV spots, where the park actively carries out Traveller Eviction processes to keep the area clean and tidy. • Listing of Colleges that offer horse management/ and or representatives from them. If it (horse park) ends up at Fair Hill, free access through the site for trail riders using the rapidly dimishing remainder of Fair Hill. Designated corridors should be established and maintained for trail riding, regardless of the events being held on the site. Events like the Bill Mills trail ride will be severely impacted if the horse park is located at Fair Hill, as we currently use the entire property, woods, field and stream. Something almost magical will be lost forever, as bridle paths don’t have the same ambiance. Both indoors and outdoor space available. Accessible and visible to both spectators and competitors. Adequate space for tents and larger trailers and set ups with parking space nearby. Good footing that can handle constant foot traffic especially in wet weather. Electrical hookups available. How about permanent kiosks in various sizes to be available for lease? Something that could be closed up and locked overnight–similar to Devon? I’d like there to be a large indoor arena that also has indoor warm up. I’d like there to be an international-class cross country course. I would like there to be several outdoor arenas. I would like the possibility to run a couple of different types of events at the same time without over crowding. I would like there to competitive trail ride possibilities. I would like there to be facilities for academic instruction…both mounted and unmounted. I would like shower/camping facilities on the grounds. as possible…built to promote the sport). I’d like the horse park to meet the needs of all types of riders from recreational trail riders to world-class competitors. Would love to see an eventing show and a breed show for Appaloosa. – tie-ins with local groups such as 4-H, scout clubs, etc. – tie-ins with local schools for field trips, curriculum support, etc. A coffee bar 🙂 and horses of course! Several decent cross-country courses, some sort of a visitors’ center with museum/exhibits and bookstore/shop, maybe a ‘hall of champions’ where visitors can see famous retired Maryland-bred Thoroughbreds or sporthorses in person. As horse owners, my son and I are very involved in the Hunter/Jumper show world in Maryland. I am also a member of the Board of Directors for the Maryland Saddle Association. In that capacity, I’ve seen the limitations imposed on Maryland horsemen by the lack of year-round facilities. Although the county-run PG Equestrian Center’s Show Place Arena is available for equestrian events, it is not a dedicated facility so horsemen compete with computer shows, gun shows, etc. The cost of the single indoor ring is also prohibitively expensive for all but a few shows. In addition, there is no indoor schooling / warm-up area available. The MHP should have dedicated indoor / covered rings for year-round use. While only one would be built on a grand scale for 3,000+ spectators, other indoor and / or covered rings could be constructed on a more modest / affordable scale. I would also suggest that the MHP have office / meeting / convention space available for the many equestrian organizations in Maryland. Subsidizing, in part, facilities for the many volunteer / not for profit groups in the State would help grow the entire industry. Full time on-site facilities, to include, tack shop, catering, and stabling etc. would be essential. Currently, at the PGEC, stalls are only available during sponsored events. It would be great if some facilities were available on an individual basis. – buildings organizes so competitors can survive; get in and out with trailers, get to sec., and food and bathrooms. When showing without help it is difficult to even get to food or bathroom. Leaving a horse in the trailer is a poor option. – safe place for visitors and spectators so non-savy people are not around horses. -vendors where the spectators are. Competitors will have to do without I guess esp if showing alone and tailoring in. Maybe a space in between the trailer-ins and the spectators. – separate parking for trailer-ins. Should have wash stalls (like Great Meadows for the polo and CT competitions). -screens like airports so the results could be typed in and viewed at several places by competitors and spectators. – Booklets on dressage to educate the spectators as to what dressage is so they could enjoy and appreciate what they were watching. This would demand media coverage too at least by the newspapers. Wonderful cross country course for BN though Advanced with several water obstacles. Several dressage areas with good footing and at least one under cover. Indoor with viewing area and area which can be used for clinics. Indoor and outdoor stadium jumping area. Water hook-ups in trailer parking area. –housing on site for events would be great! I would like to see sand/rubbber or sand arenas for both warm-up facilities and competition. Barns that provide some shade for the riders. Adequate water availability. A covered area for vendors-the only nice thing about the New Jersey horse park-adequate toilets and food. As a dressage rider in the state of MD, I would of course, like to see several dressage arenas with adequate warm up areas – not just one warm up area for everyone. And proper footing is essential. A covered arena and/or indoor would be ideal – especially for clinics or demonstrations or seminars. Adequate stabling is also essential. I think an excellent example of the above requirements is the Horse Center in Lexington, Virginia. Trees left, or planted, for shade!!!!! If it is Fair Hill…I would like the really big parking lots and barns to be carefully planned and worked into the landscape so that the beauty and peace of the current land isn’t compromised; and the arenas priced for rental so that the small groups utilizing it now continue to be able to provide fun and welcoming competitions that are affordable for “the rest of us” horse people. I’d like to see “humane exhibit” including topics such a minimum care requirements, rescue and rehabilitation (both of abused and neglected horses and horses adversely impacted in national disaster situations such as Katrina). A facility that can handle eventing, dressage, show jumping, hunter/jumpers, and driving. This would include indoor and outdoor arenas with spectator seating. It should have stabling, with indoor plumbing for bathrooms and wash stalls. There should be small sand arenas in each barn for warm up. Each barn should have a manure pit outside. Parking for trucks/trailers should away from the barns, but not too far. There should be room for a trade fair and permanent kitchens for concessions. There should be a “park center” where competitors and spectators can get information such as maps, scores, check-in, schedules, etc. Of course, real bathrooms are a must and they should be plentiful! Good, well drained footing for all equestrian activities including warm up areas. Safe access into and out of the facility for trucks and trailers. I’ve been to some places where the driveways were too narrow, and where either the view of the road was blocked for those pulling out of the facility onto the main road and/or there was a curve or hill that blocked the view of oncoming traffic. Adequate space for parking trucks and trailers near the stabling. Shady areas where horses and people can get out of the sun, near competition areas in particular! Adequate and well located restrooms would be nice especially if we would like to encourage spectators who may tend to like creature comforts! I think a good horse park would be a combination of VHC, Frying Pan Park and Commonwealth park and the Middleburg training track. It needs to be a place that can hold shows, but also be useful as a training facility for several disciplines. I would be willing to pay a membership fee to be able to use the facilities on a regular non-show-day basis as long as it wasn’t located too far from my area. I think it is important that we have good facilities that are well-maintained and accessible–not restricted or tied to particular events–if we want to continue to promote a strong horse-related industry. I think the rings should be big enough to accomadate a full size dressage ring. What about getting a covered ring big enough to show in as well. (100 wide by 300 long) with a northwest wall on it. Yes we want a horsepark. Dressage Rings!!!! : ) and perhaps lungeing rings, while I’m wishing. Also, is the park going to offer any permanent boarding (field or stall)? If so, would request more high-quality field boarding where the horses are checked twice a day, fed grain morning and evening, and have good draining run-ins with a fabulous stable manager. Thanks for the opportunity to pipe up. …Susan D. Donohue, President, Donohue Consulting, Inc.
Our family would like to see a place were the capital region pony clubs can play mounted games. How about the same or similar facilities to the Virginia Horse Center? To run really large shows (which is what we really need) we need up to 8 competition rings, sufficient warm up for all of them, an indoor with seating, a covered arena, lunging areas and lots of stabling and parking. Of course, that’s asking for as much as we can. I understand that may not be the reality, although look at the NC facility in Williamston, which is underutilized because it is a) too small for the bigger (and better income) shows and b) lacks hotels and restaurants etc.. in the area. I also encourage them NOT to go East to Annapolis or most of our Virginia people won’t even try to get there. The drive from Northern Virginia is entirely too dangerous with no hope of improvement in the future. Thanks for asking — I would like to see some resources devoted to educating horse owners about their lifelong responsibilities for their equine companions, beyond using them up and sending them to the auction. I think more and more people now agree that is unacceptable. Our industry should work to make people aware that their actions will be noticed by others, and they should understand that owning an animal comes with the responsibility of finding it a GOOD next home, or paying to retire the animal in a safe and comfortable place. One of my best friends even has a life insurance policy to pay for her horses’ care in case she is not available to do it. She is setting a new standard for equine care — one that should be promoted by equestrians in our state. I hope there can be an office, publications, signboards, etc. promoting good horse stewardship for the life of the animal. I would want the Md. Horse Park location to either be @ #1) Crownsville or Huntingtown. Here’s what I’d like to see from the Maryland Horse Park project: nothing. Like the federal and local governments, taxes in Maryland are already far too high and there are plenty of places, private and public, available for various shows and events. If all of the frivolous waste was done away with in this state—including politicians’ salaries (make politicians part-time volunteer workers rather than over-paid opportunity seekers at our expense! ), perhaps we could all have a reasonable level of taxation after an immense tax-cut. That would benefit our horses greatly! Nice shady tree lined rings; treed parking areas; permanent stalls; trails with river; Indoor for large events; camping area; covered outdoor with open sides; event course; combined driving course…rolling land; sandy so it would dry out quietly. Centrally located in MD; Maybe near Liberty Road/Route 32 area. Maybe Glade Valley Farm? We need to have some true lower rated schooling shows for the kids just starting out, or the “backyard” horse people. Too many shows are too political around here! I would like to see the Maryland Horse Park as part of a system of equestrian facilities around the State. I think that a 5000 seat stadium that will hold equestrian events as well as concerts, bar exams and rock & gem shows is a waste of taxpayers’ money. I think the State has diverse population centers and there is no need to put everything in one place. Similar diversity occurs in the equestrian community, provisions must be made to accomodate everyone equally. I work with the group that plans to develop Woodstock Equestrian Park. We have drawn up plans to phase in our equestrian facility to include an indoor arena- competition sized, several outdoor rings, 19 miles of trails, and walking trails that go past structures that date into the 1800’s and before. We are located in the Montgomery County Agricultural Reserve and plan to keep the agrarian nature of our area intact. This precludes us from asking the State Stadium Authority to look at Woodstock for the Maryland Horse Park. However, we are a fantastic location for equestrian events of the highest caliber. Many thanks for your quiery and a chance to respond to the proposed Horse Park. As well as an area of prepared footing that could accommodate a couple of outdoor dressage rings, I would like to see (eventually) an indoor arena along the lines of the PG Equestrian Center or the Virginia Horse Center that both competitions as well as clinic/seminars could be held. We belong to a vaulting club and there are no facilities at which we can actually hold major competitions clser than those mentioned above. There are also no venues for dressage competitions of any magnitude within Montgomery County. We must travel to Virginia, PG County or Baltimore county. As dressage is a major discipline in this and the surrounding area, it baffles me why we don’t have a “center” of any sort at which we could hold competitions and educational clinics/seminars. A great dressage facility with a full size well built competition arena. With good footing stone dust base with sand or permaflex. Good permanent stalls that are 12X12 with windows so horses can put their heads out and also see the horse next to them through the stalls. 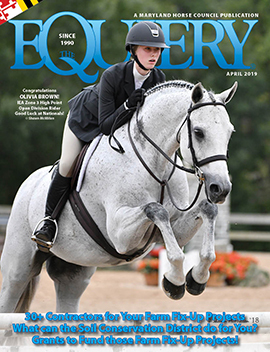 A new Maryland Horse Park presents the horse industry in Maryland a unique and promising opportunity. And although this is not a wish list for something physical for the facility, it is a critical element. What is needed most, from my perspective, is a strategic marketing plan to market horses, the Horse Park, the benefit of horses for our youth, and a campaign to highlight the affordable means to access horses for each and every age group across the state. This marketing plan would be dichotomized; a) instate and b) interstate. Each of these elements is critical to the success of the horse park and the future of the horse industry in Maryland. There is absolutely no sense in building a facility that there is no marketing plan to support. The horse industry in Maryland must assume responsibility for the marketing of our own sport and pro-actively, via a strategic, long-term marketing plan with measurable goals, begin to grow the market; horses for recreation and horses as a sport. The Maryland Horse Park needs to be successful and financially viable. To end up with a facility that cannot be financially supported means an enormous step backward for the horse industry in Maryland. Me with an exclusive contract. I love VA horse park. If it was not so cluttered it would make for nice shots, and holding classes in a barn is a little bit nuts. Build it they will come!!!!!! The Preakness, with a infield you could take your family to!! Like Delaware Park used to be!!!!!!! Maryland Horse Park wish list: miles of trails, camping facilities with water and electric hook ups and bath houses, lots of bathrooms, picnic areas, restaurants/fast foods, training track, steeple chase and x-country jumps, several out-door rings (some under pavilions) with covered seating, large in-door arena with seating for several hundred people, several hundred barns, feed/tack/farm store, grocery store, near by hotels and gas stations, I-70 corridor location between Baltimore and Frederick. I’m sure I’ll think of more! I would like to see the Maryland Horse Park house the Horse Expo that is currently held at Timonium each year. The current facility is not nearly large enough – we need something bigger and better. I would also like to see some top notch Dressage Shows held at the Horse Park, as well as something on the level of the Washington International Horse Show. Some breed shows would be nice also, like the Morgans or Lipizzans. I would love to see a full service Equine center allowing for all disciplines. Not sure where this park will be located but Southern Maryland would be great! Would like to see all the amenities of the Lexington Va horsepark. Horse Trails, 6 show rings ,cross country course, driving course , indoor arena , tack shop, food vending, lighted arena, water for horses, wash area, stalls for rent , camp area. 1. A cross country course or courses that facilitate all levels of eventing (from beginner novice to advanced). 2. Barns where a large number of horses can be boarded for shows. The barn should be well ventilated with stalls that are easy to disinfect to prevent illnesses. 3. A large, horse-friendly indoor arena where people can easily see competitors and where vendors can set up without interfering with the competitors. Also, it would be very nice if all sections of the park were easy to access by foot and by trailer. Thank you for letting us voice our opinions on the MD horse park. Good footing and safe housing for the horses. Camper hookups and a picnic area would be nice. Several rings, some dedicated to dressage – stone dust; and some for hunter jumpers – grass. An large enough area for warm up. Parking for trailers within easy access of the barns. Room for food vendors etc. Conference center or meeting rooms would also be nice. outdoor schooling rings (dressage and show jumping). Where is the Md. Horse Park going to be???? If it’s at Fair Hill, I can give you a great wish list, otherwise, I have no interest…. Thank you…. I sent this along with the survey, but here goes: 😉 more the merrier! Camping spots for larger rigs, including water, electric and pump out stations. Places to tie or portable corral horses near rig. Lots and lots of trails of varied terrains/difficulty. Access to other public use trails. Covered outdoor stalls with access to water/electric whenever possible. I’d also like to see a museum of breeds, a breeds barn where different horses can be shown and displayed in riding/ driving exhibitions. A large enough arena where events can be held and showcased year round. A Sport Horse Auction for quality horses at least 1X/year if not more. Equine product and services displayed/sold etc.. Seminars on equine health, training and breeding. (Water & Electric with 30 & 50 amp service)for multi-day events that would be planned at the Maryland Horse Park. 3. With the right facilities the Maryland Horse Park could get the Horse Expo that has been housed at the Maryland State Fair Grounds the last several years in January. 4. Trails for rides that include wagons and carts pulled by the horses. 5. Restrooms that would also have Showers that are attached to the Restroom. Entrance Showers Doors could have a combination lock so only the Paid Camping Participants have access. You also would have a cleaner Shower area than open to just everyone and anyone, plus with the fee attached you could help with some of the maintenance cost. See the Chesapeake Bay Maritime Museum in St. Michaels, Md. for they have just this set up for boats & Yachts that have docked at their facility. It works well for them. 6. Plenty of Stalls for the horses that would be staying there for the events. 7. Plenty of parking for the spectators as well as for the participants. 8. Plenty of space for turns on the facility grounds for all the vehicles with trailers, just as you would for a tractor trailer with the trailer that is 53 feet in length. 9. Area for Food Service to serve large capacity for 3 meals a day. 10. Master Plan for all the expansions of all the areas for all the needs. If I can be of any further assistance please give me a call! 3.) Good trailer parking with security. I have been at several shows where the trailers had to be parked off-site and some were either broken into or stolen outright. Several weeks ago, there was a great article in the Chronicle of the Horse about the new, privately funded horse show facility in upstate NY. This is worth reading because it really spells out what both management and competitors are looking for. And it sounds like they have really made it work. Indoor and outdoor riding arenas to accomodate many disciplines (dressage, hunter/jumper, western, driving, western etc. ), complete with grandstand seating outside and heated viewing areas inside and sound system. Barns/stables to accomodate guest horses for special events like clinics, etc. In other words, the facility would have the structure to accomodate everything from multi-discipline high level competitions, to local country fare and demonstrations. Large parking areas to facilitate trailer, bus, and other parking. Hookups for campers, etc. with water, electricity, etc. State of the Art Veterinary facilities – we could really use an emergency state of the art hospital in this area so people aren’t forced to trailer extremely injured or sick horses long distances for emergency aid. Facilities for humans to possibly host summer camps and clinics for young riders, etc., including swimming pool(s) and cabins/overnight facilities, and dining areas, indoor and outdoor. I am sure I forgot something, maybe the kitchen sink. Having a useful Horse Park will be an exciting venture for Maryland and long overdue! Where to begin? First let me thank you for giving horse owners the opportunity to voice their opinions! Thanks for letting me have my say, and dream a little! I would like to see a cross country course, serveral indoor and out door rings, a trail course, a polo field. * Hall of Fame for Maryland Harness Racing (Standardbred). Between Ann Arundel County and Fair Hill……………..FAIR HILL for sure! AA too congested and expensive. Room for 5-7 dressage rings and adequate warm-up for them, all with good footing. Good stableing with water and electric and wash stalls (hot and cold water) and isles wide enough for the stuff you need to bring for a horse show and then plenty of room for horses to get by. All weather parking for cars and trailers, preferably with shade for cars. Decent place to eat. And of course plenty of bathrooms. There’s probably more but that should do it for now!! I would like to see it in Annapolis not Fair Hill. I think the Natural Resource Management Area should stay pristine from developement unless they can use the existing area of the fairgrounds and race course. The area would be permently scarred by traffic patterns and the required neccessities. I would like to see a nice large competition venue that has indoor and outdoor rings, good permanent stabling, a great xc course at all levels, great parking areas, good venders, and a schooling course open to the public as well as trails. It would be great to have something that is useful for all disciplines( racing, eventing, hunter/jumpers, dressage, pony club, 4-H, theraputic riding, trails, etc) as well as offers shows at all levels. Have the facilities that will draw the crowds and keep it in use all year long! I received your email about a wish list for the MD Horse Park. I have never been to the Kentucky Horse Park, but have heard alot about it so was wondering if that is the plan? If so as a member of the American Shetland Pony Club & American Miniature Horse Registry one request is that if you are looking for examples of the shetland pony to please contact more than just one farm to see what an American Shetland Pony is in 2005. There are many people who still believe that the American Shetland pony should resemble those that were imported over a century ago. I am also Vice Pres of the Delmarva Miniature Horse Club so if you need contact for miniature horses feel free to contact me. It would be great if the park could accomodate at least 500 stalls so some of the larger shows could be held or perhaps more than one breed at a time could be using the grounds which would be great. Practice Rings/Arenas available to the public when not being used for a scheduled event. Carriage driving facilities of one competition ring larger than 100 meters by 40 meters and another grass area of equal size, bridges 12′ or wider, marathon course with 8 hazards so that a Combined Driving Event could be held. Restrooms with showers, trailer hook ups, plenty of wash racks, stalls with rubber mats. The NJ Horse Park is a very nice facility and worth a trip to see how they have progressed in past ten years. Including guided trail rides. There are more becoming available, but the more the merrier. That’s one thing I look for when on vacation, and I’m getting my brother and niece hooked as well. I’ve trail ridden in Washington (several places), West Virginia, Maryland, Wyoming and Colorado, and we expect to add Florida at Christmas. Trail riding is the most common use of horses in Maryland, so it deserves a place at the Maryland Horse Park, for visitors as well as locals trailering in. Inviting entry level xc course (elementaryand baby beginner bank, ditch, water, some fences) for schooling as well as regular BN/N/T and so forth. Need more places to take D-level PC and OPRC riders to school and compete. Vendors, clinics, restaurants, medical station- equine and human, and a museum of equine history of Maryland. A facility in an area where access is not congested and where there is ample acreage to accommodate the needs of the different equestrian interests, i.e., a very rural area. 1.Ample, safe, stabling with good lighting and warm water wash stalls. Also barns with real rest rooms with showers and maybe even a lounge or two. 3. Several warm up rings. Adequate lighting for evening warm up or late arrivals. 4. Large jumping arena with various style jumps including oxers and verticles, Liverpool fences, etc. 5. Indoor arena with comfortable seating for spectators with air conditioning, rest rooms & concession stands. Space for vendors inside and outside as well. Electrical hook ups for vendors. 6. Stable supply store on grounds to provide hay, feed, equipment. 7. Adequate parking for trailers and camper hook-up, separate area for spectator parking. 8. Cross country course with various distances from 1-5 miles as is appropriate for each level of competition with fences ranging from Novice Level through Advanced Eventing including water crossing, jumps into and out of water, ditches, open fields and wooded sites. Preferably designed and built by qualified professionals. A driving course would be exciting also. 9. Site to be within 10 miles of hotels who accept dogs and are reasonably priced. 10. Air Conditioned Secretary’s office with adequate space for scoring and announcer located where view of grounds is all encompassing, and lounge for volunteer workers and show officials. 11. Commercial kitchen with a dining area or at the very least a warming kitchen for quick food prep. 12. Directional signs on nearby highways and a large marquee to advertise coming attractions, shows, etc. 13. Directional signs on show grounds. For instance: to barns, to secretary, to public rest rooms, visitor services. 14. Viewing stands near rings preferably facing to the east or north, since most spectators arrive later in the day and would not look into the sun that way. 15. Adequate ring maintenance equipment, drags, water truck, tractor with disc. 19 Gift shop and museum of great Maryland horses, not just race horses, but Steeplechase, Eventing, Dressage, Hunters, Jumpers, Western Reining Champions as well. At least 4 outdoor arenas with good footing, stabling, trails, cross country courses, and an indoor arena with seating for shows and clinics/symposiums, etc. A few hundred permanent stalls. Multiple outdoor rings – 3 or 4 at least. One with spectator seating. Maybe even a grass ring? Toilets that flush. And sinks with running water. Maybe even some showers. A PA system that you can actually hear all over the show grounds. Plenty of trailer parking so that you don’t have to do any backing. An exhibitor’s hall (for “social” functions). Decent food (I know I’m dreaming on this one). Ok, that’s all I can think of for the moment. I’m sure I’ll come up with more! Thanks for asking! The Lexington KY park should be the example for our park…..Areas for H/J, Dressage, Western, Polo, etc……Cross country courses……..Large indoor………A museum to give the history of equine sports in MD…… Stalls to hold successful MD bred /retired horses. A store with horse books and other equine items , with a small movie viewing room to show promotional films about the States great equine tradition, picnic areas etc. Nice Stalls!!!!! I have been to several large facilities and nobody has compared to the Virginia Horse Park in Lexington–that is a super facility. The stalls are well ventilated, spacious, wide alley ways, close access to water and electricity and ample wash stalls. Use them as a reference and you can’t go wrong. * horse auctionsI would love for it to be located in Frederick or Carroll Counties! I really believe that we should try to follow the format of the Lexington Horse Park in Virginia. There are bathrooms in each barn and a very user friendly shower area. There is alot of room for full camper set-ups which many riders, including myself, need in order to show. There is even a dump-site. Very impressive showground. As for arenas, the idea of a covered arena attached to the main one is perfect. Then there is always a place to warm up, either late at night or during a rain storm. I also like that there are a few different areas for warm up around numerous show areas. Gives a person with a young horse a choice of where to go to get away from the crowd or to even lunge. I like the full metal sliding doors and metal front walls. You can see the horses clearly and there is no reason to bring alot of extra equipment to attach buckets, bridle racks,etc. This also saves on the wear and tear of the building and keeps it looking nice. Water is conveniently situated a short distance from every stall and there are even wash areas in the middle of each barn. Again, it keeps the place neat and safe. I would try to figure out a way to put a manure pit near the wash stalls so that perhaps the people that insist on leaving the stalls filthy after washing their horses would maybe clean up after themselves. I am very excited at the prospect of having a horse park in Maryland. I moved here from NY years ago since I wanted to compete against good riders and horses. It has saddened me to see Md lose more and more competitions to Va, N. Carolina and NJ. There is just no reason for it to happen. Md has had a long history of horse sports and it is about time that we have a show place to be proud of. I was a staunch proponent of the horse park initially, and I still think it can benefit everyone if done right. After talking with many of my local equestrian friends and fellow users of Fair Hill, I understand and share some of their concerns for Fair Hill. I think the Stadium Authority’s Plan is too grand and would have a significant impact on the Fair Hill Natural Resource Area as well as the State of Maryland. With that said, we have no public water and sewer systems in Fair Hill. We cannot accommodate or need commercial development in “the Park” FHNRMA, or along the adjacent scenic byway – Route 273. I have a few unanswered questions for the Stadium Authority: How would the horse park be profitable? Would it be affordable to the vast majority of non-profit groups that rent the existing Fair Hill facilities? or would they have to relocate to somewhere else affordable? There is no where else like Fair Hill. Would the various youth groups that currently use Fair Hill for their organized activities without a fee be able to do so in the new Horse Park ? I am all for making improvements to the existing Fair Hill Equestrian and Fair grounds areas but not a commercial development of the magnitude the MD. Stadium Authority is planning. We as equestrians need to have input into what develops as a Maryland Horse Park. We don’t want to see a financial failure, a “black eye”, that the tax payers of this State hold “all of those horse people” as well as the current politicians responsible for. In Summary, keep it simple. Horse people are very adaptable, we have to be. 1. Breed shows and/or keurings, inspections, etc. And what I’d really like to see would be … the whole shebang in Frederick County! Dressage, Jumping, Cross Country area’s with spectator seating, Ampatheatre for guest speakers and trainers, Concession building, Rest room facilities. etc. I do think Shows, clinics, camps (both children & adult) would be nice. Also, I’d like to see a horse related museum that would be fun & informational. 8. Permanent rest room facilities scattered around acreage. p.s. and while I am wishing….cheap dorm type rooms with showers and a lounge for overnight competitors and grooms. 3-5 miles of cross country DRIVING course. Something interesting to visit, like a building displaying different types of tack and riding wear for different disciplines and periods of history. Clinics on all subjects. Introduction to showing for those of us who haven’t shown in a while. Training of the horse AND rider. Psychology of horse. Shows to rival the fine shows of Europe, particularly Germany and Holland. Opportunities to see Kur dressage competitors. Bring the Lippazaners, what a fabulous show they give. I would like to see a cross country course open to the public. I would also like to see some educational facilities where students from local schools could be taught about horses (care, training, respect). The Kentucky Horse Park is an excellent model – outdoor and indoor show rings, cross country courses beginning to advanced, polo fields, steeplechase course, educational facilities, museum. I go there at least once each year and always enjoy. Virginia Horse Park doesn’t have as large or as nice as Kentucky but they (Virginia) have facilities for stabling for larger shows. Thank you for your interest and open minded approach to the proposed horse park. The process calls for the development of a feasibility study and economic impact analysis. This process and input from the users and citizens of the county are imperative to answer many of the questions raised. Our goal remains to upgrade and preserve fair hill. I would like to see a Cross country schooling course open to the public, like what’s at Frying Pan Park. I would like to see Starter Horse Trials run; there are so few in the area (surprisingly). I would like to see shows that cater to the lower-level “mortals”. There’s enough for the Olympic hopefuls. Breed demonstrations, like what they have in KY’s Horse Park. Possibly a job when it comes time to sell the farm & downsize. Although we make up a small representation of the Maryland horse community, we are very active and determined to do what we love and would most definitely take full advantage of having appropriate facilities available in order to rope more frequently. I know folks from southern Jersey, Delaware, southern Pennsylvania, northern Virginia, and all parts of Maryland who would come to a new place to rope where they were accomodated and welcomed. With that said, I would be willing to volunteer my time to assist with this on a consultative basis regarding “how” to set up what would be required to accomodate this group of horse enthusiasts. Thanks for listening and taking this into consideration. Sarah’s wish list for the horse park. 1) I would like to see an excercise track. 2) Stabling for at least 200 horses, with room for mobile stabling. 3) Two regulation polo fields with irrigation and stadium seating. 4) A three star level cross country course with room to grow. 5) At least 3 outdoor dressage rings and two indoor rings. 6) A jumping arena with stadium seating. 7) Expert staffing and experienced personnel running the whole thing this includes an in-house large animal vet. I would like to see the Maryland Horse Park be very similar to Virginia Horse Center. A large colisium is essential, but just as important will be numerous smaller indoor, or covered arenas. Multiple ourdoor rings with seating around some or them. Lots of weather tolerant footing. Stabling should be patterned after Virginia. Warm in the winter, and cool in the summer. The Frey Brothers type stall fronts and doors are absolutly perfect, safe and attractive. There should be better food vendors than Virginia has, more of them and with better hours. The security at the VHC is top of the line, and one always feels safe there. The trailer hookups and showers are essential and are always in demand. The arenas, and the management should be ready to facilitate any type of horse sport or activity. The goal should be to keep the property booked so it can pay for itself eventually. There should be timber and steeplechase,flatraces, eventing, hunter jumpers, dressage , western of all sorts, etc……. And please make it attractive with alot of green areas. It is a very exciting prospect for the Mid-Atlantic horses. The Crownsville site is ideal because it offers so much for the “rest of the family” to do if only one or two members are horse oriented. There must be lots of available hotel rooms in the IMMEDIATE vacinity. A huge problem with the Fair HIll site is lack of hotel rooms, and what there is is in Delaware, and that will not bring in tax dollars to Maryland!!! MHP should accommodate the whole family and encourage horse sports among the young who will become future horsemen. Not all siblings may be interested in horses and ponies, so let’s include something for all; otherwise, Mom or Dad may have to find another place to take the family. For example: Carousels and rides young, skate park (a la X-Games ESPN Zone at Franklin Mills, PA) for the homeboy in the family, horse-oriented video games, and petting stables. Educational, multi-screen cinema with kids? movies like Black Beauty, Misty of Chinqueteague and Brighty of the Grand Canyon, more mature films for adults and world-class educational presentations — fox hunting, racing, showing, driving, breeding, long-distance, jumping, training, grooming, shoeing, horsemanship, tack, hay and feed varieties, farming and harvesting, storing, stabling, vanning, and so on). Tack shop, boot maker, tailor, etc. Sample racing yard complete with smells of stalls, liniments, feed room, tack room with hands-on demonstration of proper techniques for all aspects of horsemanship. Lots of trails, cross-country type obstacles (including water), lighted ring for public use – possibly even an indoor area. The only two things on my wish list would be adequate warm-up and good footing! I’d like to see a Cross Country Course (I think that was planned), and space for vendors (probably also planned). I think at least one indoor and out side arena would be a minimum. The arenas should be set up so that multiple disciplines could use. I don’t think we should get into boarding but I think stalls for events that cover more than one day would be necessary. Have you heard if there would be a committee(?) to discuss what kinds of events would be draws to use the facility? What a wonderful idea! A wish list. As a board member for a Maryland Horse Rescue, and a horse lover, I can of course think of all the obvious needs: stadium ring, dressage ring(s), cross-country course, etc. But I think the property could serve a much greater purpose. Thinking of what is happening in Louisianna and Mississippi and all those displaced equines, wouldn’t it be prudent to construct a venue that could serve as an evacuation area for local equines if need be? If Maryland were to ever get really hit, harder than we did with Isabel, what would we do with our horses with pasture fences ripped to shreds, pastures under water, and food and water supplies destroyed? If designed well, the barns could be used as temporary housing. A couple pastures would serve not only visiting show horses housed at the facility for a 3 or 4 day event, but would also give refugee horses a place to run and frolic. When not in use these pastures could serve as hay fields and bring income to the park. On a lighter note, there really should be museum to pay tribute to famous Maryland Horses like Native Dancer. Sagamore Farm should be included in the tribute as a working farm dedicated to horses for way for over 60 years and counting. Pimlico’s place in history should also be highlighted. Just some passing thoughts. I’m sure there are plenty of other wonderful attributes we could add. Equine Rescue & Rehabilitation, Inc.
Dressage Arenas (with adequate warm up areas) and trails would be my main focus. Thanks! Anything that pertains to and for horses. btw, my daughter Christie is going to the AEC’s next week – we are very excited – wish us luck! I do not think Maryland land and tax payers dollars should be used to build another horse park. Instead I would like to see efforts to improve existing parks and horse show venues. Building another park would take business/usage away from the existing facilities and contribute further degradation. Western – pole bending, barrel racing, trail, etc. And all the other wonderful events that can be done in horse sports. Adequate facilities for AA rated shows. Museum with references to Rose Hill Carriage museum. Riding for the handicapped display. TB rescue display and donations. The horse park at Lexington VA is pretty much ideal. Whoever designs the Maryland facility should take a trip there. The stalls are large and safe, the barn aisles are wide, they have plenty of rings and warm up areas, there are many nice bathrooms and shower facilities that have been added, nice trailer camping area. The Maryland facility should have at least 800 stalls with area for portables if needed to attract the large shows. It would be nice if there was a “food court” instead of one vendor holding all exhibitors hostage with hot dogs, fries and burgers (yuck!). Also lots of trailer parking near the stabling area. I don’t like having to take my trailer waaaay up the hill to park at Lexington during the big shows. If I forget to unload something it is a long trek. Hopefully whoever designs the Maryland park will have input and hands on from the active horse community so it doesn’t end up like the Prince Georges equestrian center. That’s all I can think of now. * stabling and facilities adequate for Pony Club rallies in dressage, show jumping and eventing. Currently our Pony Club Region holds their Show Jumping Rally, our only 3-day, overnight rally, in Quentin, PA. It would be really nice to have stabling and facilities right here in Maryland to support Pony Club! It is the young riders of today that will be supporting the Horse Park as adults. Trails were not mentioned on the survey they sent out, so I doubt that they are thinking in that direction at all. If the property is large enough (e.g., Fair Hill), there is no reason why trails cannot exist in perimeter areas. Hope majority of Fair Hill trails are preserved. • I have also recently started team roping and it is quite tough to find a venue for any of the western sports in this area. (I have been to Cow Town in New Jersey and they manage to draw quite a crowd.) I would love to see some rodeo events at the horse park and especially some jack pot ropings. • I would also enjoy watching Polo and show jumping. • It will need a lot of trailer parking and it would be great if it had camper hookups. Virginia’s Horse Park in CENTRAL Maryland. If they have it at Fair Hill I would still rather use the Virginia Park over the Maryland park. Four hours of driving is four hours of driving until you add the Baltimore beltway with a horse trailer on a Friday night –NO WAY! And I’m sure the western half of the state feels about the same. After seeing the recent news maybe the money should be used to buy Pimlico and Laurel and when there is not racing have horse shows, events, etc. Back in the 1970’s the Maryland Horse and Pony Show was held on the Timonium Infield and that worked. Not only is racing a major part of Md history it is also a key player in the Md economy. What would happen to the farms, the people who work on the farms and at the tracks, the suppliers of all that is needed and the open land. We cannot let this happen ! Can the Md Horse Industry Board, with Rob Burk organizing, make something happen. • A venue to take over Morven Park meaning numerous shows! Hello and thanks for the query. Speaking for myself, I enjoyed the vastness of Morven Park, the hacking fields and all of the venues there. I would expand on that with an indoor facility like that at the “Maryland Horse Center” off Rte. 301. Build the barns with plenty of airy openings and wide overhangs to enable people to braid etc. Have good drainage at barns and arenas. Have parking close to each barn. The dorm rooms at Morven were so great even though they were not a/c. You were very close so you could say goodnight to the horses or keep watch if one needed care. The Los Angeles Horse Center seems well organized, too. There is a good tack store there which seems to serve many disciplines. Well, I will end there as this is due to you tonight. I look forward to hearing about the plans as they develop. Two Indoor Riding Rings if one is supposed to be big like Prince George’s, then I would like a smaller one for smaller venues such as local jumper shows or Dressage of Therapeutic Riding Shows. Decent warm up rings to go with nice show rings. all arenas need proper base (river sand deep base, covered by water filtering riprap- maybe #2 covered by blue stone dust with terra fabric cover and then topped with blue stone dust (like the main arena at Menfelt). On site housing for full time barn/grounds manager-supervisor several turn-out paddocks with diamond wire mesh fencing with top board. well intergrated sound system to cover both the close arenas and the X-C course. That is just off the top of my head, but I will think about it further. I would also like to be involved in the development of the MD horse center. Horse Trials of all levels. Thanks so much for the clear and detailed exposition of what facts are known about the planning for a show facility in Maryland that appeared in your September edition. While it cleared up much of my confusion, I still have a couple of questions that I hope someone can answer. 1. Every discussion of the Anne Arundel County proposed site (Crownsville) mentions that the property has Route I97 somehow running through it. Wouldn’t this be a disadvantage? Last time I looked the Washington area wasn’t like Saratoga! How will people get across the street? 2. Fair Hill is awfully close to Devon, isn’t it? Nice for the folks in Pennsylvania, NJ and Delaware. It’s a long haul for many people in Maryland. I’ve not seen this issue raised. Or is it considered an advantage? 3. Finally, and peripherally, for those of us, especially in Montgomery County, who probably won’t be showing at these exalted levels but want to participate in recognized shows, the fate of Morven Park is a real nail-biter right now. Since this issue probably won’t make the national media, I hope Equiery will keep us informed about what is going on and what we can expect with the same clear, complete, and unbiased coverage, even though technically it is Virgina news. I would love to see an indoor arena with seating for at least 10,000 and classrooms for educational opportunities. Proximity to hotels, restaurants and entertainment so that the Maryland Horse Park would be able host educational seminars and international events and draw a large number of spectators. An onsite vet facility for use during competitions and an enclosed/covered area for farriers to work during events would be an added bonus. Multiple outdoor dressage arenas, a cross country course, a stadium jumping arena, permanent stabling, onsite food concession facilities with indoor/covered seating, a jousting track/course (Maryland’s state sport), adequate trailer parking near the stabling and trails for pleasure riders. I’d like to see a new TB auction site to replace the old one at the MD State Fairgrounds. It might be possible to have an arena used for smaller horse shows also viable for auctions. I’m assuming this would be a big center and would need more than one arena. Excellent footing; close proximity between rings, stabling and offices. Central MD location, NOT near DC and it’s wonderful traffic jams. SAFE, solid, suitable, stabling, built well enough to house stallions, on occasion. And side walls TALL enough for warmbloods, stall matts, and minimum 12 x12. Harford Countys’ Heavenly Waters is a fairly perfect set up, and used just about every minute…oh, and comercial kitchen facilities, wash racks, and plenty of access to potable water and electric for fans etc.Good PA system. One of the aspects I have found to be important when showing is to have facilities in a cetralized location. There is not much that is more frustrating then having to walk a mile from stabling facilities to your show ring. The horse park in New Jersey is a great example of a well thought out park with the stabling, warm up, show offices and show rings in close proximity to each other. Good footing in rings is an obvious must as well as ample warm up areas. Thanks!! Would love to see event course for Novice on up, dressage practice and competition rings, as well as show rings. Space set up for both English and Western Competitors. Room for us to host competitions on the level of the Washington International, MENFELT, FAIR HILL, etc. Would like us to host upper level competitions for Western Competitors also such as the speed events, which are great to watch and real crowd pleasers also. Would also like educational Pavilion suitable for seminars and clinics to draw notable equestrian talents to our area. And the appropriate stabling and turn-out room for horses that need to be housed while on the premises visiting. I would like to see in the MD Horse Park a cross country course, a schooling cross country field open to the public, permanent dressage arenas and GREAT stabling! And, a STARBUCKS!! classrooms for offering classes, lectures etc. I’d like it to be at Fair Hill-the area is already laid out for horse competitions. I’d like to see solid barns with wash stalls/hot and cold water. A human bathroom in each barn would be ideal. Several warm-up rings, the show ring, and some indoor arenas. Several concession stands. Several bathroom facilities. The Fair Hill Natural Resource Management Area is considered to be the “gem” of Cecil County Maryland. It offers 5600 acres of upland forest, fields and the drainage for the upper Big Elk Creek valley. Twenty years ago it might not have been an unusual landscape in pastoral Cecil County. Twenty years from now, as the County grows and develops, it seems destined to be an island of nature amidst the sprawl of suburbia. I joined hundreds of local citizens in 1997 to ensure that future generations could enjoy the natural, cultural and recreational resources at Fair Hill for many years to come, in the creation of the Fair Hill Land Unit Plan. This plan states that there should be no commercial development of Fair Hill outside the existing fairgrounds area, that its rural, unimproved nature should be preserved, and that it should be retained for future generations to enjoy it as we all do today. As a multi-use facility it contains numerous horseback, hiking and biking trails. There is a Nature Center which educates children. There is abundant wildlife and a diversity of flora. It is also home to some rare and endangered species. Fair Hill offers unspoiled views of woodland, field, and stream. There are also a fairgrounds, racetrack, training facility, grandstand, barns and horse stables. These existing horse facilities already occupy about 600 acres. I’m not opposed to jobs and opportunity in my County. I don’t think a horse park is an evil idea. I would like the proponents of this venture to dig into their own pockets and purchase a suitable area to erect such a facility without altering our singularly unique multi-user Natural Resources Area. If it is the economic engine they say it is, then they should back their claim with the appropriate capital investment. Taking our irreplaceable open space is a way of taking taxpayer money for private gain. They should pay their own way. 7. semi level parking that doesn’t turn into a swamp in bad weather 8. spots for campers to park with electric hook up, both the large plugs for campers and regular plugs for those that just want access to electric for fans, heaters and coffee pots. All this and a reasonable rental fee so that groups can/will rent it and still be able to make a profit on their show. An indoor or at least a cover over the ring and grandstands. Bathrooms and a snack stand not too far the from barn, arenas, and parking lots. Several water sources in the barn, even with hoses, would be great. Electric Outlets not to far from stalls, so in the summer, fans can be used, etc..
Quick access to doors, in case there is an emergency and is easy to get out.